The pipeline Collection is the latest innovation for bathroom fittings from the Allied Brass brand of products. Add this hook to your bathroom, mudroom, etc. And efficiently hang towels, robes, or any other belongings that should not end up on the floor. This 3 position multi hook gives the industrial look of pipe fittings while blending aptly with both modern and traditional bathroom decor. This accessory is powder coated with lifetime materials to provide a decorative and clean finish. No wonder, this utility hook gives continual service for years without any trouble. 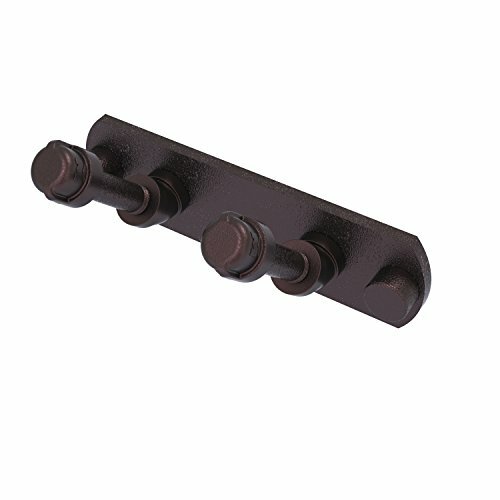 The choice of superior materials makes this item free from corrosion and rust. Multi hook mounts firmly with our concealed screw mounting system and comes with a limited lifetime warranty. Provide yourself with an extra-large and convenient bathroom towel storage space using this ladder towel bar. This accessory has 4 rods to allow for plenty of space to hang your towels. The pipeline Collection is the latest innovation for bathroom fittings from the Allied Brass brand of products. 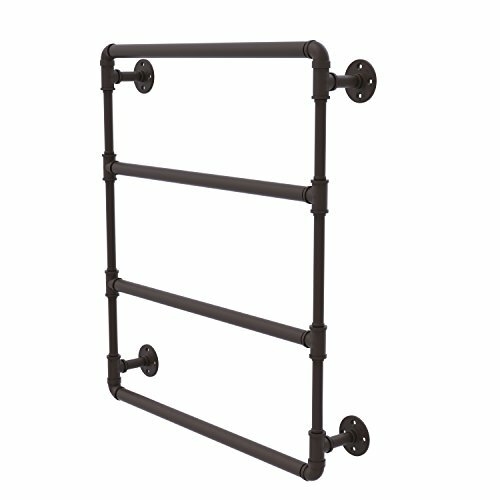 This ladder towel bar gives the industrial look of pipe fittings while blending aptly with both modern and traditional bathroom decor. This accessory is powder coated with lifetime materials to provide a decorative and clean finish. The choice of superior materials makes this item free from corrosion and rust. Ladder towel bar mounts firmly to the wall with color coordinating screws and comes with a limited lifetime warranty. Add a stylish touch to your bathroom with this elegant train rack towel shelf. Our versatile design makes efficient use of your space. 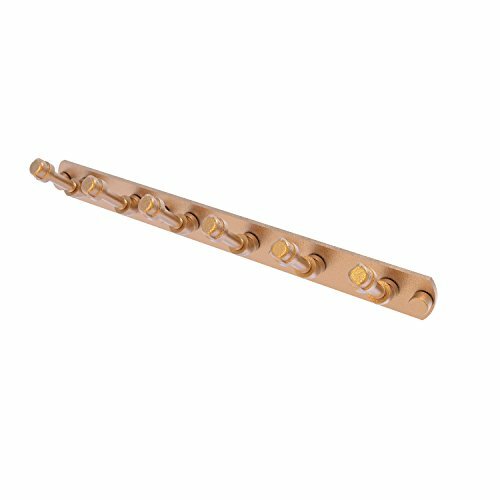 This elegant train rack is created from the finest solid brass materials. Our high quality designer finishes are hand polished to perfection. Provide yourself with a convenient bathroom towel storage space. 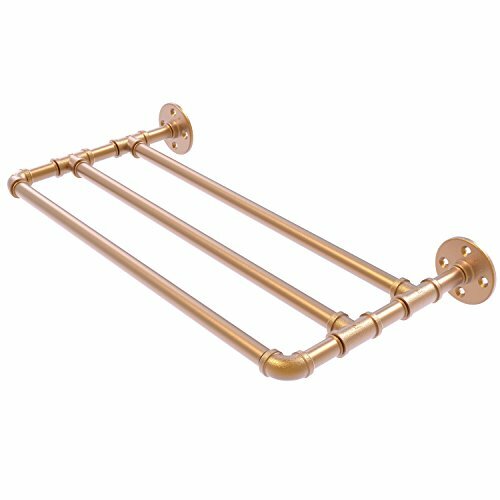 The wall-mounted towel shelf from Allied Brass upgrades your bathrooms appearance. This urbane accessory unites functionality and fashion. The pipeline Collection is the latest innovation for bathroom fittings from the Allied Brass brand of products. This towel shelf gives the industrial look of pipe fittings while blending aptly with both modern and traditional bathroom decor. This accessory is powder coated with lifetime materials to provide a decorative and clean finish. The choice of superior materials makes this item free from corrosion and rust. Towel shelf mounts firmly to the wall with color coordinating screws and comes with a limited lifetime warranty. 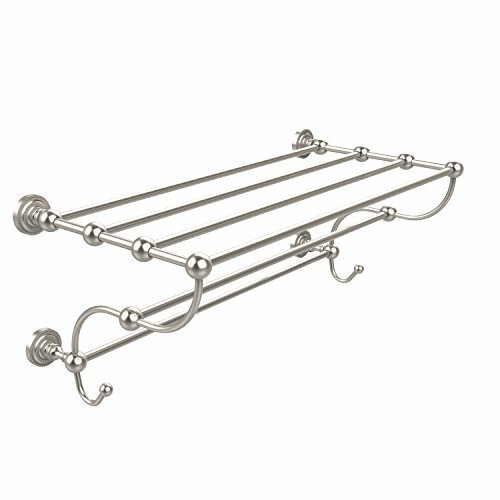 Save space in your bathroom, with this fashionable towel bar with integrated hooks. This towel bar from the pipeline Collection is an excellent choice for a modern bathroom. Its simple, yet stylish design, adds a sleek finish to your bathroom. Any of our designer powder coated finishes make this bar a perfect fit for any style. This bar looks wonderful in any bathroom and it gives a feel of comfort and safety. Its integrated hooks add convenience to this towel bar, as it allows you to also use this accessory for holding your bathrobes or for drying your towels before placing them back on the rod. This accessory is powder coated with lifetime materials to provide a decorative and clean finish. The choice of superior materials makes this item free from corrosion and rust, and is provided with a lifetime limited warranty. The pipeline Collection is the latest innovation for bathroom fittings from the Allied Brass brand of products. Add this hook to your bathroom, mudroom, etc. And efficiently hang towels, robes, or any other belongings that should not end up on the floor. Also works great as a tie and belt rack that you can use to organize your favorite accessories. This tie and belt rack gives the industrial look of pipe fittings while blending aptly with both modern and traditional bathroom decor. This accessory is powder coated with lifetime materials to provide a decorative and clean finish. No wonder, this tie and belt rack gives continual service for years without any trouble. The choice of superior materials makes this item free from corrosion and rust. Multi hook mounts firmly with our concealed screw mounting system and comes with a limited lifetime warranty. The pipeline Collection is the latest innovation for bathroom fittings from the Allied Brass brand of products. 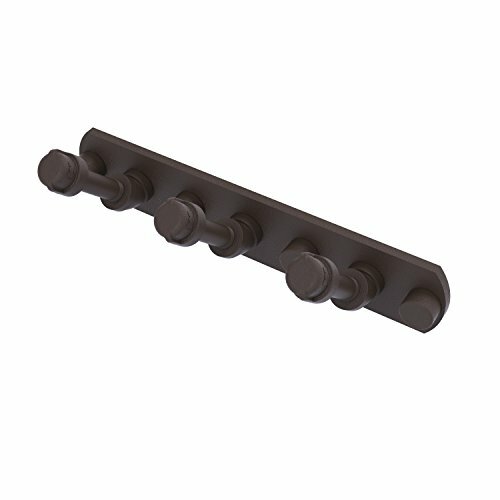 This 2 position multi hook gives the industrial look of pipe fittings while blending aptly with both modern and traditional bathroom decor. This accessory is powder coated with lifetime materials to provide a decorative and clean finish. No wonder, this utility hook gives continual service for years without any trouble. The choice of superior materials makes this item free from corrosion and rust. 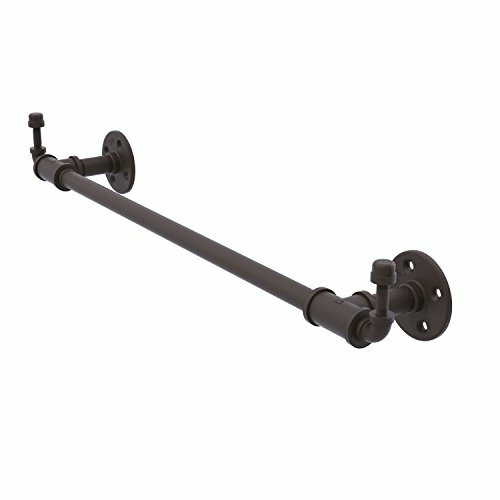 Multi hook mounts firmly with our concealed screw mounting system and comes with a limited lifetime warranty. Looking for more Allied Brass Dottingham Collection similar ideas? Try to explore these searches: Flask Shot Glass, Studio Rack, and Game 3 Tennis Shoe. Look at latest related video about Allied Brass Dottingham Collection. Shopwizion.com is the smartest way for online shopping: compare prices of leading online shops for best deals around the web. Don't miss TOP Allied Brass Dottingham Collection deals, updated daily.